Looking for a unique act with a huge stage presence that will exceed your expectations? 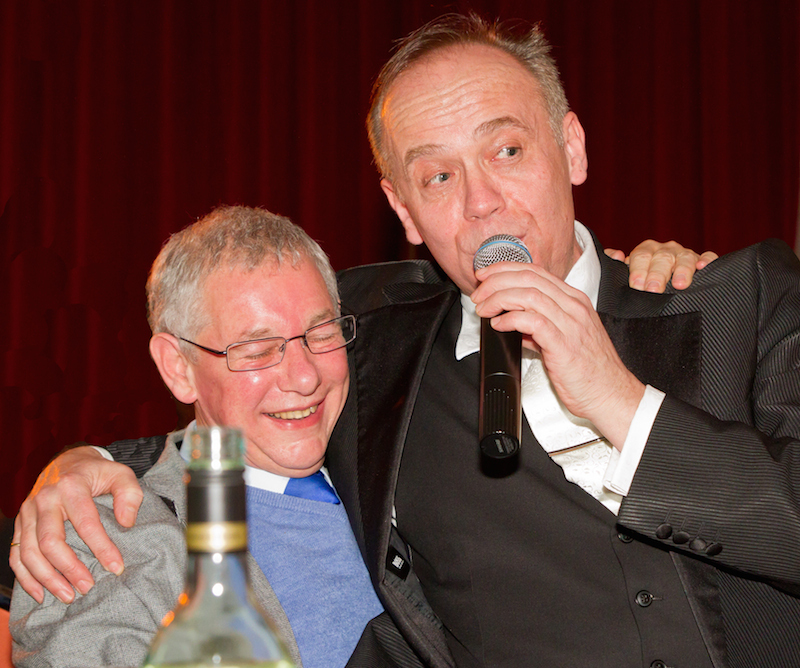 Twenty years experience entertaining audiences all over the world - so you know you are in safe hands! 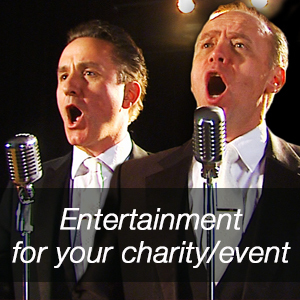 Whatever the function, be it Dinner Evening, Sports Award Ceremony or Conference, the Opera Dudes can supply the perfect entertainment for your event. We can offer a range of scenarios to add a surprise element to the event. Singing waiters, inebriated guest or some other character unique to your event. 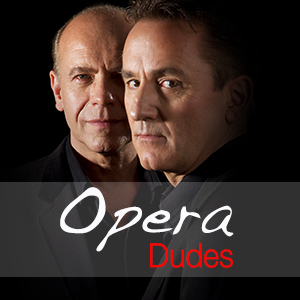 Whether you are planning a Wedding or Christmas party, let the Opera Dudes delight and entertain your guests.We discuss with you and plan the whole day's entertainment, including the choice of songs. 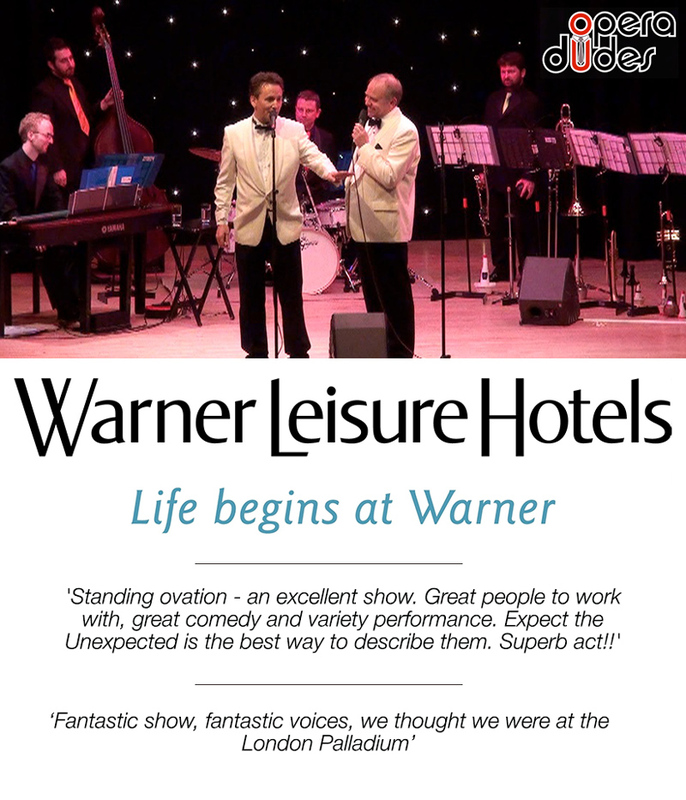 Our repertoire is extensive, covering a wide range of styles including opera, swing, music theatre and popular music. 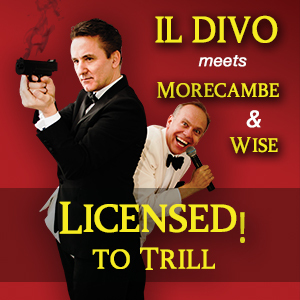 The Opera Dudes also have their own band for their Theatre Show "Licensed to Trill". 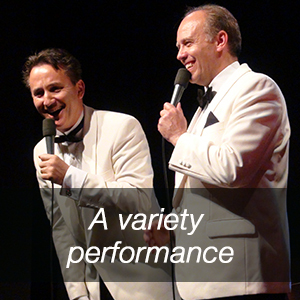 A unique cocktail of fun, laughter & great music of all styles that will leave you both shaken and stirred. 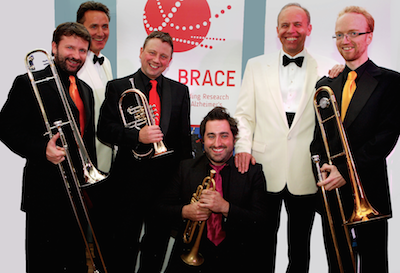 Follow the link below to see the Dudes live on with "Jimmy the Lip Band"
The Opera Dudes have worked with many charities and tailor the entertainment to every event. "Planning an event like ours can be stressful and it is so reassuring to know that your entertainment is going to make the whole thing easy, efficient and above all fun for everyone." Desert Island Dudes with Pam Ayres! "The Opera Dudes pinned the audience to the back wall with their take on Opera"
The essence of an Opera Dudes show is fun with great singing added to the mix!! The Opera Dudes are well known for getting your guests in the right mood, lifting spirits and turning your event into a night to remember! "Everyone had a great time and were it not for the Opera Dudes and their laugh-a-minute banter we wouldn’t have exceeded our target by as much as we did." 'Thank you for such a fantastic evening ! So many people said it was one of the best evenings they have ever had - wonderful voices with such a wide repertoire to be enjoyed by all and great fun. A real professional and class act! The only problem is - how do we top this?! "These are conspicuously skilful performers-everyone is exhilarated on stage and off"